No, I am not really a person who calls their furniture by names, actually I have never even had a car with a name! But I would like to introduce you to my new (well very old) Edwardian sideboard. I found it at the local charity shop, which is known for having furniture treasures, when I dropped off 3 bin bags of old clothes, yesterday. I slapped a hold sticker on it and raced home to measure up! I wanted it for storage for my new home office instead of a traditional bookcase, but as I am moving into big boy's old box room, I needed to make sure it would fit, as I have a habit of buying pieces of furniture that seem perfect in the shop, but once I get them home are enormous! Luckily the sideboard would fit along any of the 3 walls, with the exception of the wall with the door on it. A very lovely friend of mine is going to help me paint it, who owns Simply Gorgeous (the most divine hand painted furniture boutique, online store coming soon) and I just have to decide which of the Annie Sloan chalk paints I am going to go for! 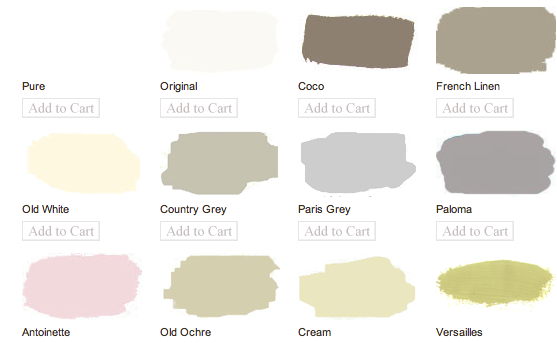 I'm undecided between Country Grey, Old Ochre and Paris Grey. The walls are cream, but it's not the brightest room, so want it to be subtle, without being too dark. It was £68 and is in immaculate condition, with the original key to lock the two cupboards. There are two deep drawers in the centre and one of the cupboards has a single shelf. The other has a sweet, 4 part sliding drawer at the bottom! My lovely Mummy has given me my birthday money early and treated me to it! Check back soon for my progress and the big reveal! Or shall I go bold and go for Louis Blue?! Out with the old ... in with the .... old!